Secure your Identity and Passwords so that you can think about the more important things in life. How does Identity Protector work? Identity Protector is a tool to find and secure your Personal Information on your computer, as well as organize your passwords in one vault across browsers and lock them securely with a “Master Key.” Your identity is always protected, and you’ll never forget a password again. Identity is our prized possession. Once its stolen, it can cause a lot of harm to you. See how your identity can be stolen so that you can take necessary action even before you get attacked. How Secure is Identity Protector? Identity Protector scans your computer for any traces of Personal Information and any saved passwords and locks them away in a “Vault” on your system that can only be accessed by a single Master Key password that you create. Even we don’t know your password because it’s encrypted on our servers. PC Scan: Scan & clean all security traces from your PC. Identity Protector securely locks your personal and financial information so that you can unlock them using your own master key. Deletes all potential security traces (passwords, credit card details etc.) from your PC. Secure Your Identity in 3 Easy Steps! Scan your computer for existing identity traces that can be stolen. 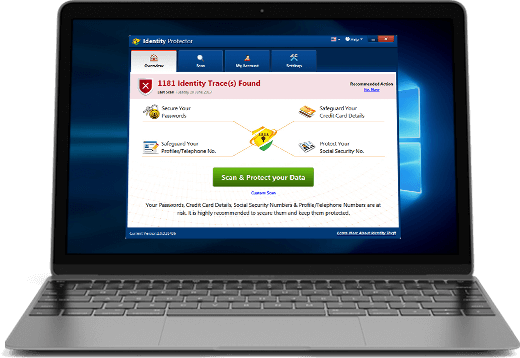 Remove scanned identity traces from your PC to stay safe & secure.